To the below left, the Star-Spangled Banner is shown in the exact proportions and pattern of the original. 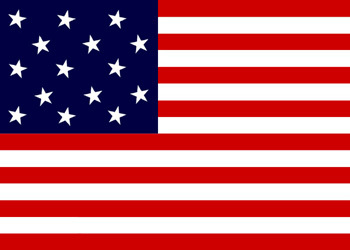 Note the slightly canted position of its fifteen stars and that it has fifteen stripes—two more than modern American flags. For the purpose of illustrating its enormous size, it is shown to scale with a six-foot man, the smaller 17 by 25 foot storm flag which flew over Fort McHenry during the battle, and a modern 3 by 5-foot flag commonly displayed at American homes. The term "Star-Spangled Banner" commonly refers to the flag that Francis Scott Key viewed over Fort McHenry on the morning of September 14, 1814 following the bombardment of the fort by the British. The Star-Spangled Banner was commissioned in early July of 1813 by Major George Armistead, the commander of Fort McHenry. Major Armistead provided instructions that the flag should be "...so large that the British will have no difficulty in seeing it from a distance." The Star-Spangled Banner was constructed by flag-maker Mary Young Pickersgill of Baltimore, Maryland during July and August of 1813. Mary was assisted by her 13-year old daughter, Caroline, and nieces Eliza and Margaret Young. Mary may also have received help from her mother, Rebecca Young. Work on the flag was initially performed in Mary's home but had to be moved to the malthouse of Clagget's Brewery for final assembly due to the large size of the flag. Mary was paid $405.90 for her work—a considerable amount in 1813. The Star-Spangled Banner consists of fifteen alternating red and white stripes and fifteen stars on a blue union. It was constructed of red, white and blue wool bunting, with stars of cotton fabric. Linen thread was used to sew it together. Each stripe is two feet in width, and each star, two feet in diameter. The entire flag measured 30 feet by 42 feet and weighed in excess of 150 pounds. Unlike modern flags in which the rays of the stars point vertically, the rays of the stars on the first, third and fifth rows are canted slightly towards the "fly" end, while the stars on the second and fourth rows are canted slightly towards the "hoist" end. By virtue of its size, the Star-Spangled Banner is considered to be a "Holiday" or "Garrison" flag. Flags of these type are only flown on Sundays, holidays, or special occasions during periods of good weather. The Star-Spangled Banner was not flown during the 25-hour bombardment of Fort McHenry—a smaller 17 by 25-foot version of the same pattern known as a "Storm Flag," was used since the British attack coincided with a heavy rainstorm. "Storm Flags" are traditionally used during periods of inclement weather to preserve larger flags from excessive wear. Sadly, the fate of this flag is unknown although it can be reasonably speculated that it was used until it was unserviceable, and then disposed. Key witnessed the attack on Fort McHenry from a distance of about eight miles aboard a small American sloop anchored in Baltimore Harbor. Key, along with Colonel John Skinner, had sailed under a flag of truce to the British fleet intent on securing the release of Doctor William Beanes. Beanes, a patriot and a friend of Key, had been arrested by the British in the aftermath of the battle and burning of Washington. Following successful negotiations with Admiral Cockburn of the Royal Navy, Key, Skinner and Beanes were permitted to return to their ship—however as they had knowledge of the location and strength of the British fleet, they were not permitted to return to Baltimore until after the attack was completed. The Star-Spangled Banner was hoisted over Fort McHenry the morning of Wednesday, September 14, 1814 following the cessation of the British bombardment to signal the American victory. Aboard his sloop in the darkness, Key wondered what the silence of the guns meant—had the fort fallen? He anxiously peered into the darkness and awaited the dawn to see whether the American flag still flew over the fort. The sight of this flag in the light of the early morning inspired him to write a poem which he entitled "Defence of Fort McHenry." This poem served as the lyrics to our National Anthem. Key wrote his poem on the back of a letter he had in his pocket. He completed writing it at the Indian Queen Hotel shortly after being permitted to return to Baltimore by the British the evening of September 16, 1814. The climax of Key's poem and our National Anthem—the point where he sees the Star-Spangled Banner still flying over Fort McHenry signaling the American victory—does not occur until the fifth line of the little known second verse. The more familiar first verse tells only about the attack on the fort and Key wondering and hoping on the outcome of the battle. In the seldom-used third verse, Key expresses his bitterness towards the British, then offers a prayer of thanksgiving and a petition for the future in the fourth verse. Key's brother-in-law, Judge Joseph H. Nicholson, was given the poem and immediately realized that its words fit a popular English melody "To Anacreon in Heaven." Nicholson took the poem to a Baltimore printer on September 17, 1814 and had a number of copies printed. On September 20, 1814 Key's poem was printed by both the Baltimore Patriot and The American, with a note indicating "Tune: Anacreon in Heav'n." The song quickly circulated became quite popular with seventeen newspapers printing it throughout the United States. Soon after, it was published under the title "The Star-Spangled Banner" by Thomas Carr of the Carr Music Store in Baltimore. The first public performance of "The Star-Spangled Banner" took place at Captain McCauley's tavern in Baltimore during October 1814—less than two months after the battle. A good idea how this would have sounded is available at the audio link, below. The Star-Spangled Banner was maintained over the years by the Armistead family as a memento of the battle. However, during the Civil War the flag was, ironically, sent to England for safekeeping. A red chevron was later sewn to one of the white stripes by Louisa Armistead, widow of Major George Armistead. Reportedly, she had intended it to be the letter "A" (probably for "Armistead") but never completed it. Throughout the late 1800's, the Armistead family cut pieces from the flag to present as relics to veterans, government officials and honored citizens. Those receiving these relics, treasured them with reverence and pride, often framing and displaying them in their homes. As a result of this practice, over two hundred square feet of the Star-Spangled Banner was given away, including one of its stars. The illustration to the right depicts the flag as it is today with the gray areas indicating areas that were cut off and presented as relics by the Armistead family. In 1876 the flag was loaned to the Smithsonian for the nation's Centennial Celebration. It returned to the Smithsonian as a permanent donation from Armistead's descendants in 1914 and has been on exhibit at the Smithsonian Museum of American History since 1964. Listen to "To Anacreon in Heav'n"